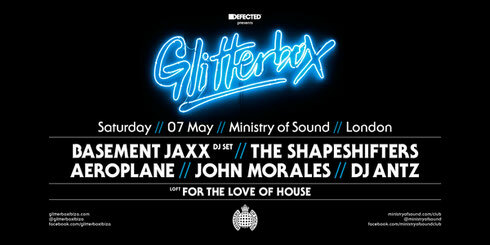 With Ibiza season just around the corner, Glitterbox hits Ministry of Sound on 7 May, hosting DJ sets from Basement Jaxx, Shapeshifters, Aeroplane and more. Established in 2014, Glitterbox aims to be a celebration of dance music – the DJ, the sound, the space, the attitude, the ambience and the audience. Over 30 years of classic disco and house music, plus contemporary offerings that share the same philosophy, go into making up its soundtrack. In keeping with all of Glitterbox's events, each DJ has been carefully selected for an apparent ability to move an audience. While much of dance music is constantly trying to reinvent itself or retread the paths walked before, the brand stands still, confident in its classic soundtrack and ability to deliver all the ingredients that make up that special party you've looked forward to all week.